It’s not every day you get dinner and a show at the same time. 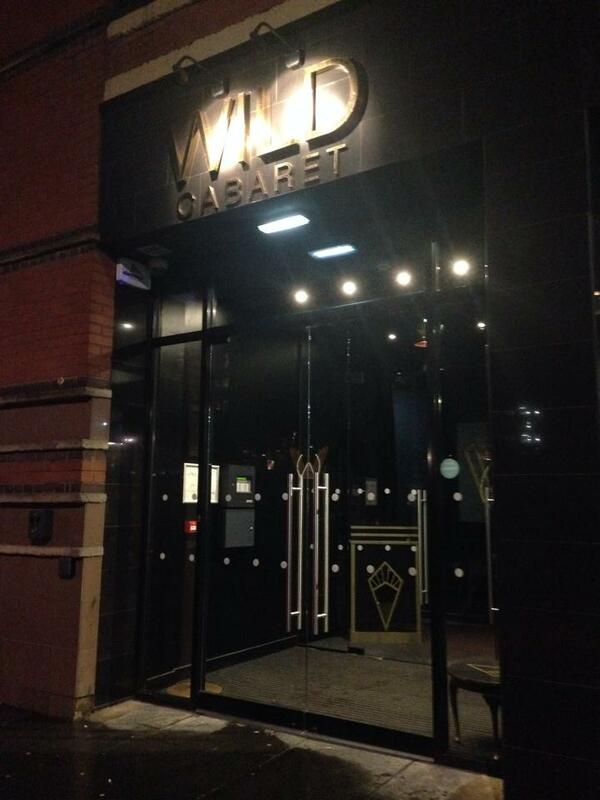 Usually it’s dinner before a show, or after, but at Wild Cabaret in Merchant City, you are literally surrounded by acrobats, show girls and cabaret hosts as you tuck in to your meal. I don’t think this is a place that’s for everyone, it’s very much a marmite situation, you’ll either love it or hate it and I LOVED it. From having a microphone stuck in my face and told I had no tune, to watching Jesus strip, every part of it was silly, fun and interactive. Before the show started though, we had time to order drinks and peruse the menu. We were escorted to our seats, which were two sitting opposite each other at the end of a long table which sat around 10 people. Not very private, but that was part of the whole experience and didn’t really phase us. 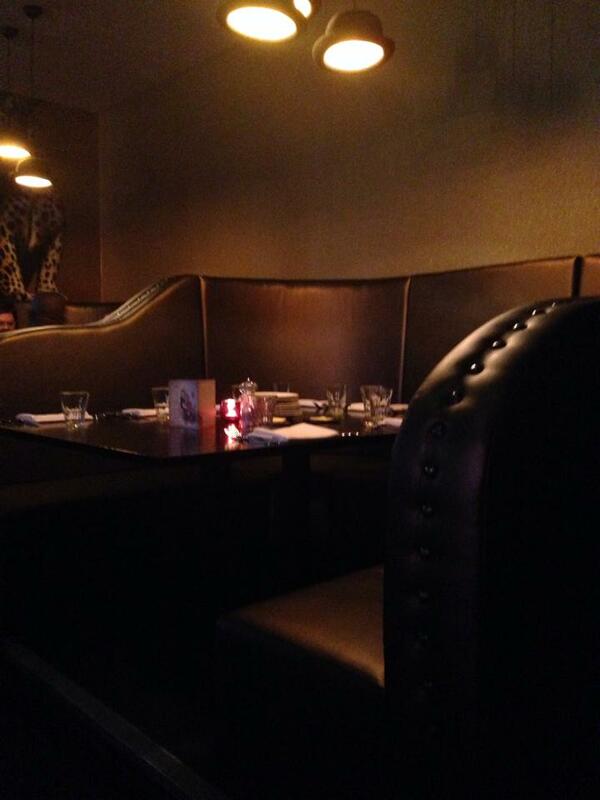 The décor inside the Wild Cabaret is truly stunning and really gave you that first initial cabaret feeling. 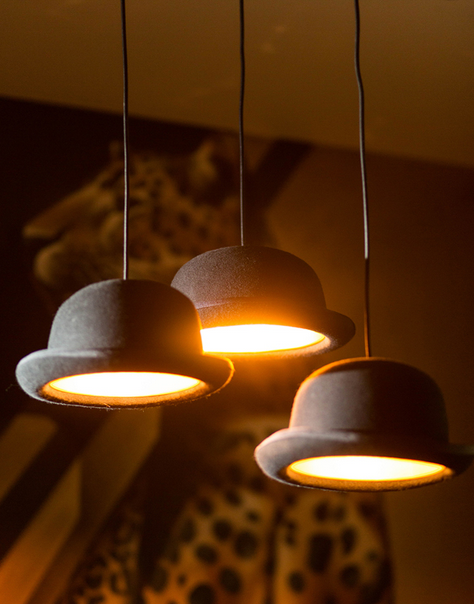 The main colour scheme was black & gold, with large leopard murals and amazing bowler hat lights. I should point out that, although I brought my actual camera with me so I could capture the evening, the battery died almost immediately and I had to use my phone, so I can only apologise for the quality of the photos. We had originally been told we were booking the Christmas menu and asked to place a 50% deposit of £55 which I thought was pretty steep, and on arrival, we were given the normal menu and told the Christmas one wasn’t available until after next week. This was a little disappointing, but the evening menu was very similar so we ordered some wine and debated over what to eat. Looking at the starters available on the menu, I decided to just go right out of my comfort zone and order the scallops. I don’t usually eat seafood but I always think scallops look so tasty and elegant, plus they came with haggis AND black pudding. I’m not really sure what possessed me to make this decision; I guess none of the other starters really appealed to me! The show began just as our starters arrived. We were introduced to our host, Des, and our first act, a woman who could do some serious hoola-hooping. As a first taste of the show to come, I was pretty impressed and the host was great at getting the crowd excited. My starter, the scallops, was, and I can’t quite believe I’m saying this, delicious. The scallops had a lovely caramelized top and perfect texture, without the fishy aftertaste. 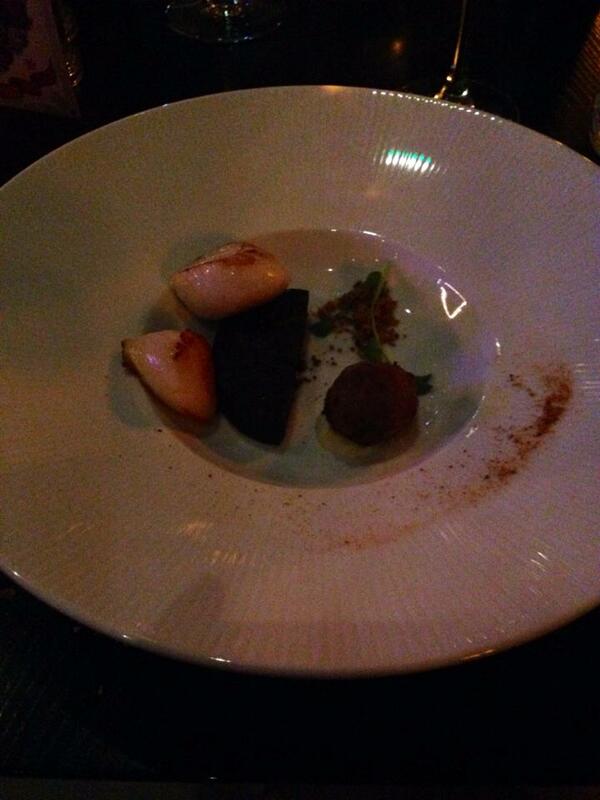 They went perfectly with the wedge of black pudding and the little haggis fritter. By this point I was beaming with delight – I was ready for my next course and for the show to go on! I cheated a little bit with my main course and ordered a sirloin steak, again I think because I wasn’t overly excited by any of the house mains. When our steaks arrived, I ended up with Sam’s fillet. 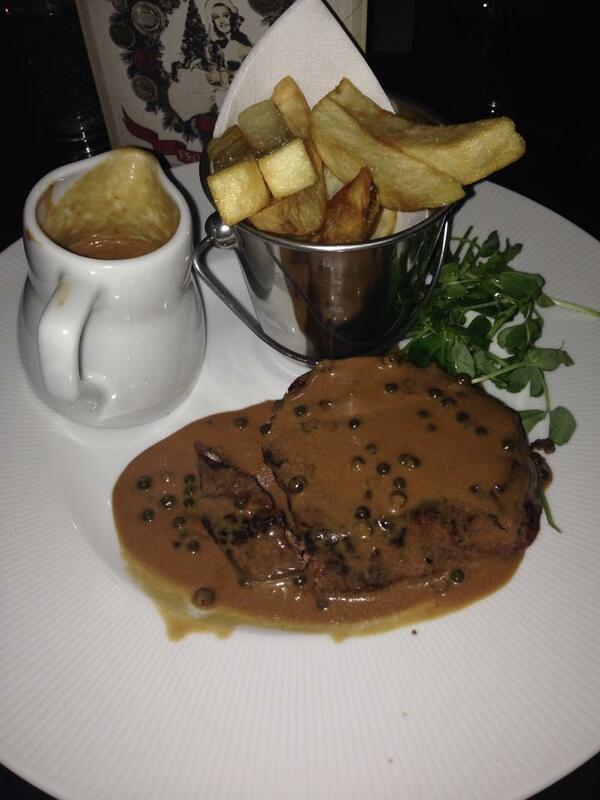 Before he noticed this though, he poured the peppercorn sauce all over my sirloin, something I never do. I got over it and we switched steaks, both of which were cooked perfectly to order. I had asked for mine medium-rare, which a lot of the time isn’t done quite right, but this steak was exactly right, and already had the fat removed which I really appreciated. It was really flavoursome and the peppercorn sauce was fiery, creamy and tasty, except for a faint earthy taste I couldn’t put my finger on. For my dessert, I chose the Pear Tart Tatin, which came with little chunks of fresh pear, a pastry tuile, fresh cream, caramel sauce, and a flavour of ice cream I don’t remember because at this point we were well into our second bottle of wine. I think it was vanilla. 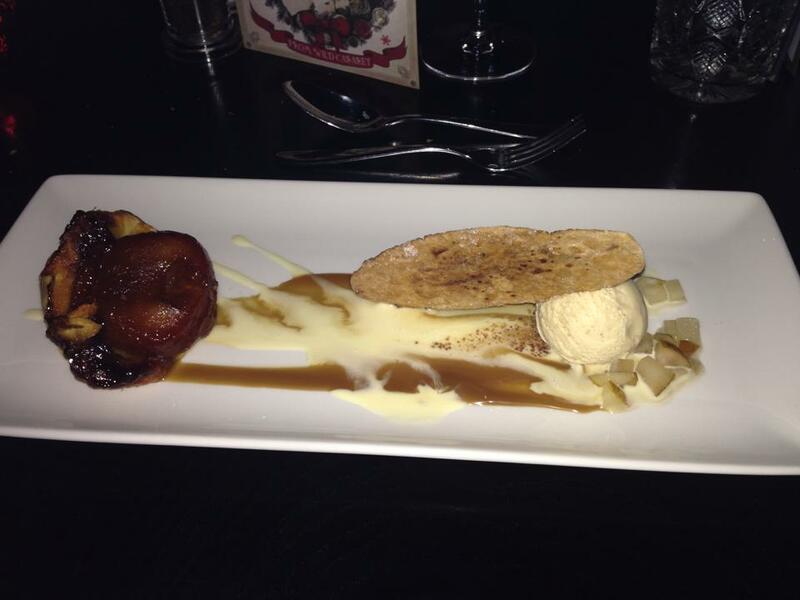 Although my photos don’t do it justice, it was a really great dessert – the pear was caramelized and warm, the pastry crisp and flaky – paired with fresh pear and cold ice cream, what’s not to love? Throughout the course of the show we saw a man swallow razors and swords, a mind reader, the can-can, aerial acrobatics, singers, a Glaswegian parody on burlesque and a stripping Jesus. It was so camp, so shocking, so silly and SO. MUCH. FUN. Sam and I spent the entire evening gasping and laughing at the acts, complementing the food and talking about all the people we knew that would love it. We both can’t wait to go back, but I think it might be better enjoyed with another couple or with a group of friends because it’s really a shared experience. Our bill was not cheap – although the set menu cost around £32.50 for three courses, there was a supplement for our steaks, we ordered 2 bottles of wine, and treated ourselves to a glass of champers each with our desserts. It can be done on a budget, we amped up the price on the drinks, and it is entirely worth the price as you have the table (if you want it) until 3am, with the cabaret finishing around 12am. 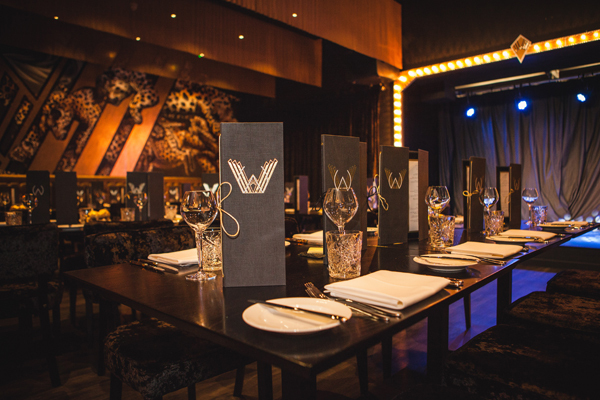 If you’re looking for something special to do this Christmas, birthday, whatever, I highly recommend Wild Cabaret – the food is beautiful, the staff are friendly, and the show is spectacular. Sounds like you had a fab night!